Mikhail Gorbachev was born on March 2 1931 in Privolnoye, Stavropol territory in the North Caucasus, to a peasant family in a small village. His father was an agricultural mechanic on a collective farm. In 1942 at the age of 11 his district was occupied by the Germans, leading to 3 years of hardship during the Second World War. After spending time as an agricultural assistant in 1950 Mikhail Gorbachevenrolled as a law student in the University of Moscow. Here at university Mikhail Gorbachev became a full member of the Soviet Union Communist Party (CPSU). Also at university Mikhail met and married his life partner Raisa Maximova Gorbachev. After receiving his degree in law in 1956 Mikhail made rapid progress within the Communist Party. By 1970 Mikhail had become the first Secretary for Stavropol territory, governing an area of 2.4 million people. By 1980 he had been made the youngest full member of the Politburo. After the death of Chernenko in 1985 M.Gorbachev was elected General Secretary of the Communist Party a position of enormous power. During his period in office M.Gorbachev introduced several policies which revolutionised the internal and external affairs of the Soviet Union. Firstly Perestroika or restructuring involved opening up the Soviet economy to market forces. By 1987 private ownership of business was allowed for the first time since the 1920s. These reforms came partly out of the inefficiencies Gorbachev had seen in State controlled agricultural sectors. Due to the large scale inefficiencies within the Soviet economy the transformation to a market economy has often been a painful one. However after several years of inflation and falling GDP the Russian economy has started to stabilise and this policy is generally viewed favourably by the Russians. 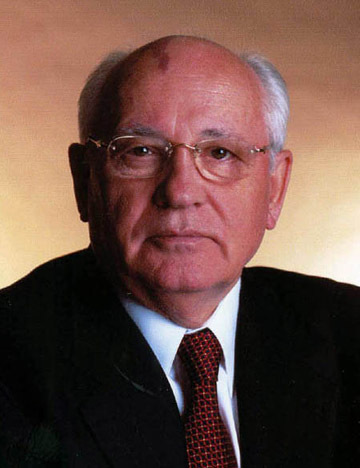 In internal affairs Gorbachev introduced the concept of Glasnost (openness) this was a distinct break with the authoritarian past of the Soviet Union. Glasnost led to greater freedom of speech, freedom of worship and a reduction in State control over individual lives. Many 1000s of political prisoners were released during Gorbachev’s period in government. Ironically this greater freedom of speech was used to great effect later by the many critics of Gorbachev within the Soviet Union. In the 1980s the Soviet economy was struggling due to the inefficiencies of a planned economy but also the huge sums spent on the arms race. Gorbachev felt the Soviet Union could no longer afford to spend such great sums on military spending and therefore sought a reduction the arms. This led to nuclear missile reduction treaties with America and effectively ended the Cold War which had dominated international relations since 1945. Western leaders such as R.Reagan, G.Bush and M.Thatcher spoke warmly of their impressions of this new style Russian leader. In 1989 the Soviet Army also retreated from Afghanistan, this had proved a contentious and costly war for the Soviets. Abandonment of the Brezhnev Doctrine. In 1988 Gorbachev announced that the Soviet Union would no longer follow the Brezhnev doctrine. The Brezhnev doctrine was formulated in 1968 and was used as a justification to maintain Communist control over the Warsaw Pact countries. (This was used during the military termination of the Prague Spring in 1969.) Effectively Gorbachev gave Eastern European countries the right to pursue their own political agenda. This more than any other policy had a remarkably quick and significant effect, drastically changing the European political map. Starting with Poland, the Eastern European countries experienced generally peaceful democratic revolutions, with Pro Soviet Communist parties being replaced by other democratic parties. Most symbolically in 1989 the Berlin Wall was torn down allowing East and West Germany to reunite. In recognition of Gorbachev’s role in bringing an end to the cold war he was awarded the Nobel Peace Prizein October 1990. Despite praise from outside the Soviet Union, Gorbachev had many enemies within the Soviet Union. On the one hand the Conservatives were alarmed at what they saw as the break up of the old Soviet Union. They wished to maintain the military and political power of the old Soviet Union. On the other hand modernisers led by Boris Yeltsin felt there was need for even quicker change in making the transition to a market economy. In 1991 Gorbachev was placed under house arrest by conservative critics, this was known as the August Coup. After 3 days Gorbachev was released, but on returning to Moscow his power had inexorably shifted away into the hands of Yeltsin. The Soviet Union and Politburo had become effetively defunct and Gorbachev resigned as President in 1991. Since 1991 Gorbachev has made abortive attempts to return to politics but has never been able to gain significant popular support. Since then he had devoted his attention to projects such as the Gorbachev Foundation and the Green Cross International. The Green Cross international is an environmental organisation dedicated to attempting to solve key environmental problems. Raisa, the wife of Gorbachev died of Leukemia in 1999. They had one daughter Irina Gorbachev.